Having antivirus software installed is essential in protecting your computer against online threats as there are many different types of malware. Choosing a good and effective antivirus is important because every antivirus application has different detection rates, some with higher detection rates while some are low. The bad news is, we will never have an antivirus that can detect every single piece of malware out in the wild. Running multiple different antivirus programs can possibly help to achieve a near perfect detection rate but this can cause system instabilities, slow downs or even system crashes due to software conflicts. There are however 3 different methods of scanning your computer with multiple antivirus. You can either install an antivirus software such as TrustPort that has optimized multiple antivirus scanning engines to work together, use a front-end that calls the on-demand command line based scanners, or a cloud scanner that uploads unknown files to remote servers for scanning with multiple antivirus scanner. Here we have 5 software to scan your computer with multiple antivirus for free. herdProtect is an outstanding cloud-based anti-malware program that uses 68 different antivirus engines to scan unknown files from your computer, offering the widest coverage and earliest possible detection. Unlike traditional antivirus software that is huge in size, herdProtect is very small at merely over 2MB in file size. Unknown files from critical areas where malware normally resides will be uploaded to herdProtect for scanning with 68 antivirus engines. herdProtect can be used as a second line of defense together with the antivirus that is installed on your computer system. 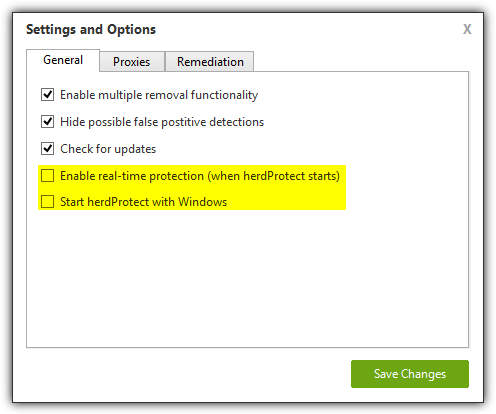 Another advantage found in herdProtect is the ability to enable real-time protection from the Settings and Options area. herdProtect is free and currently in beta. An upcoming protection platform will be made available soon that offers the capability of scanning and removing malware with real-time protection. 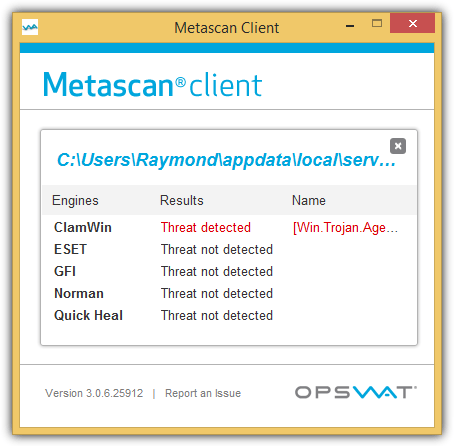 Metascan Client is a portable application that allows you to quickly scan active processes and loaded libraries for malware. 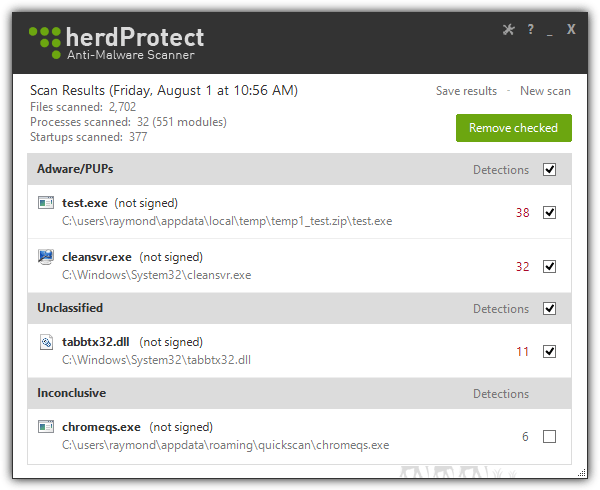 It is a cloud based scanner whereby the technique used to detect malware on the computer is similar to herdProtect except it uses only 5 antivirus engines (ClamWin, ESET, GFI, Norman and Quick Heal) to scan the uploaded unknown files. 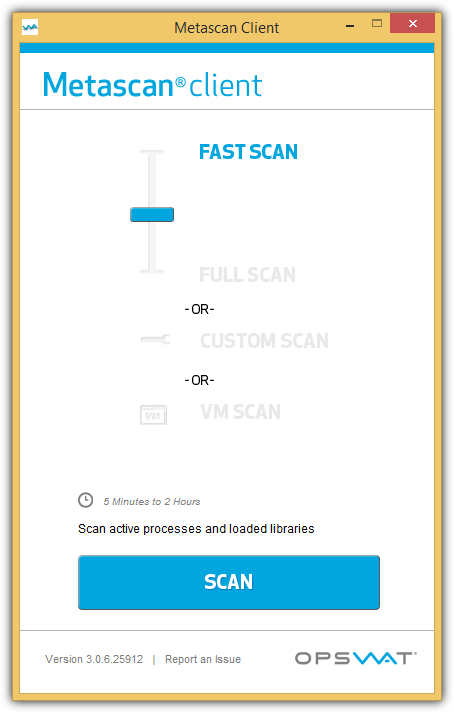 Do note that this free demo version of Metascan Client only allows you to select two different modes of fast scan while the full, custom and virtual machine scan options are disabled. Metascan Client failed to detect the rootkit keylogger that we’ve installed but managed to detect a non-hidden process trojan as a threat. Metascan seems to stop scanning with other antivirus engines if the first engine detects it as a threat. The trojan that we used is well known and publicly available to download where most if not all antivirus detects it as a threat. As you can see from the screenshot above, only ClamWin detected it while the other 4 reported as clean. HitmanPro is a popular cloud based anti-malware program that is free for unlimited scanning but only a 30 day trial for removal. HitmanPro’s cloud used to have 5-6 different antivirus scanning engines but it’s now limited to only 2, fortunately they are Bitdefender and Kaspersky which are top in the industry. To start a scan, simply run the program and click the Next button which will start the default scan mode. A quick scan mode is also available which takes less time to scan as it scans less areas in the system. HitmanPro is much more sophisticated than other cloud scanners because of the behavioral scanner to analyze if the suspicious file has the characteristics of malware. As you can see from the screenshot above, HitmanPro has no problem detecting and removing a low level rootkit based keylogger. In fact it can even detect bootkit malware that hides in the Master Boot Record. SecureAPlus comes with 3 methods to combat malware which is an offline antivirus (ClamAV), white-listing and the Universal AV which is their cloud. The Universal AV cloud claims to use 11 different antivirus engines which are Emsisoft, Avira, McAfee, Microsoft Security Essential, ESET, Bitdefender, AVG, Norman, Quick Heal, Total Defense and Clamwin. After installation, an initial full system scan will run which will take quite a while to finish because it scans every file on the computer rather than just the critical areas. A very important note about SecureAPlus is its still in beta. The Universal AV cloud doesn’t scan uploaded files instantly at the moment and this would mean that if a sample has not yet been scanned before, SecureAplus will simply report the file as safe and would not detect it as a threat. Until the real-time cloud scanning has been implemented, we’d advise you to avoid using SecureAPlus other than just for testing purposes. Multi-AV Scanning Tool is a front-end for 4 command line antivirus scanners (Sophos, Trend Micro, Avira, Emsisoft). It used to be 5 with Kaspersky on the list but has been removed since the DOS engine has been phased out. Using the Multi-AV Scanning Tools is very easy as all you need to do is to press the number on your keyboard according to which scanner you want to run. Running the scanner the first time will take a longer time to launch because it needs to download the scanner and full virus signature. After briefly testing Multi-AV Scanning Tool, we couldn’t get Sophos and Emsisoft to run while Trend Micro and Avira works fine. Raymond, can you tell me how do you get the realtime option on HerdProtect settings ? Because I’ve download it and there’s no option to turn on the realtime protection.. also I’ve googled everywhere and it’s all the same info as in their website : there’s no realtime option yet on HerdProtect… really wish I could use it as a realtime scanner for my computer. loaris protect in real time has gone. now is evolutioned to reason core security. Love this tool. Harnesses several scanners’ power without the pains of dealing with individual GUIs. It would be painful to be so thorough without this tool. It would be nice if this tool could receive some updates to include new scanning engines that may have become available by now. If not, perhaps release the source? Thank you very much Raymond.!!! I’ve been an avid fan and user of Multi-AV for several years and have never encountered a single issue with the software erasing files from a hard drive. I have used this program as well since 2006, and I have to say that at no point has executing this program wiped out my PC. Furthermore, I have known David Lipman through usenet since 2004, and he is one of the best in alt.comp.virus. With that said, this tool is great. 2) That a hard drive is wiped out by the bug that this program and its modules are intended to kill. If the latter, than it would be nice to know exactly what bug is doing this, and if this is purely coincidental or if somehow David’s tool (or the AV tools bundled with it) are specifically being targetted by a virus/worm/other malware. I have used this Mulit-AV since 2006 on several systems. It has always performed nicely and have never had a problem with any of the 4 scanners. It is a good tool to have to fight the bugs. Thank you David H. Lipman for your hard work! I was able to use the sophos and trend without problems. This software sounds very good. Wow! Thanks for this Raymond!